At Portland Farmers Market it is our mission to contribute to the success of local food growers and producers, to share the understanding that we as farmers, makers and consumers all carry the responsibility for developing a more sustainable food system and create a space for vibrant community gatherings. We want all neighborhood residents to have access to farm-fresh food and to offer a space to learn, build, nourish and be part of an inspired community. We thrive on making positive personal connections with our neighbors, community partners, and our farmers. All this would not be possible without the help of dedicated volunteers! Together with our neighbors, we strive to make Portland Farmers Market a place to build community, learn about food and sustainability. If you want to join us in supporting and building relationships with your neighbors, review the job descriptions below and then fill out a volunteer application form here. You can also view our Volunteer Manual 2019 for more information. Where can I buy a baby artichoke? Are all these vendors organic? Where is the restroom? How can I become a vendor at the market? Where is Powell’s Bookstore? Where are the crafts? These are just a few of the questions the volunteers at the Information booths answer each and every Saturday. If you want to learn the inner workings of the market, hang out in a beautiful place, and meet a lot of people, this is the job for you. Written material, maps and weekly updates are provided. Oversight of the Veggie Valet area is part of the job. Skills required: Excellent customer service skills, positive can-do attitude, a welcoming smile, being courteous to all shoppers, problem solver and ability to remember a variety of fun facts. Great Pumpkin! Berry Fest Day! Do you consider yourself to be crafty or super creative? Do you get into the nuts and bolts of putting on a party? We are searching for people who would like to be involved with the Market and are project oriented. PFM occasionally hosts food celebrations, classes and other one-time events, as well as participating in the events of other community organizations. Our events bring chefs, speakers, children’s activities, contests and special demonstrations to the regular shopping atmosphere. You may be called on to decorate the Information booth, set-up a stage, hang signage or many other myriad of tasks. This position may involve some early hours depending on the market location and event. Time commitment: Approx. 3 hours depending on event. Skills required: Experience interacting with children and the general public, ability to think on your feet and move in a fast-paced environment, creative and fun-loving attitude. Want to get to know the market vendors? Do you thrive in an ever-changing environment? Do you like chatting with people? VOAT volunteers arrive at the market and help with whatever needs to be done- hence the name! Duties are varied but can include giving solo vendors bathroom/lunch breaks, customer counting, helping with current programming, folding brochures and much more. Duties can change from week to week! Of course, any duty assigned is not required: if a volunteer is unable to perform or uncomfortable performing any duty they are highly encouraged to let staff know. Time commitment: Shifts are typically 3 hours, 10am to 1pm, but can be tailored to the individual volunteer. Skills required: Willingness to perform a wide variety of duties, ability to walk and stand for up to 3 hours (with breaks) and excellent communication and customer service skills. Do you enjoy making connections with your neighbors? Do you value knowing where your food comes from? Have you ever wanted to try Parkour? If this sounds like you, then being a neighborhood market Volunteer of all Trades (VOAT) can make your volunteer dreams come true! 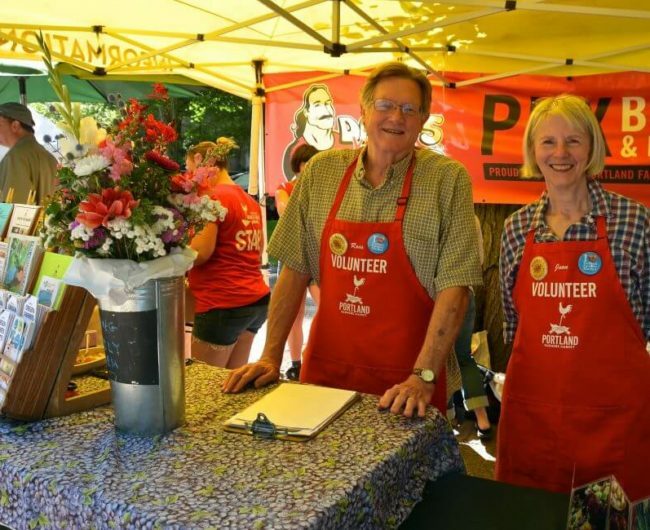 PFM is seeking people who know their neighborhoods and can serve as connectors between the Portland Farmers Market and their community. As neighborhood VOAT you will truly be called upon to be an integral part of bringing our farmers market to your community. You will work in the market booth answering customer questions, selling market merchandise, assisting PFM vendors and musicians as needed. PFM staff has many responsibilities in bringing the market to your neighborhood. Setting up and taking down the weekly market can be a physically rigorous job with many tasks to check off their list. As neighborhood VOAT you will also help the staff set up/take down tables, chairs, umbrellas, our market booth, market signs and the music stage. Whew! This is why we need nimble volunteers with a make-it-happen attitude for this job. Time commitment: Shifts are typically 3 hours and can vary depending on your neighborhood market. VOAT shifts are some flexible and can be tailored to the individual volunteer. Skills required: Willingness to perform a wide variety of duties, ability to lift and carry up to 50 Lbs. and to walk and stand for up to 3 hours (with breaks), excellent communication and customer service skills. Are you a people watcher? Do you long to hang out on street corners and watch the parade? With the constant growth and evolution of our market, monthly customer counts are essential in keeping market data up to date. PFM is constantly growing and evolving, and we like to keep track of this growth, so once a month we count the customers entering each corner of the market. A volunteer red apron and a click-counter is the trademark uniform for a Market Surveyor. We provide you with a red apron and click-counter. This job provides lots of time between counting for shopping and exploring the market. From time to time, we like to know what our customers are looking for, if their needs are being met, what they like and what they’d like to see more of. Market Surveyors can help with simple customer surveys (held appx. 3 times a year) to help our team determine the future direction of our markets. Time commitment: Customer counts, 10 minutes on the hour at each corner for 30-40 minutes, for up to 3 hours. Market Survey, up to three hours, but flexible. Skills required: Customer counts, ability to stand (there are places to sit if needed) for 10 minutes at a time; ability to avoid distractions. Customer surveys, ability to stand up to three hours with breaks; ability to engage with the public. Do you like organizing other people’s closets? Do you enjoy listening to podcasts or audio books while you do busy work? Sometimes we need help in our office rolling and tagging merchandise and with other office tasks. Our office is a casual, welcoming environment operating Monday through Friday 9am-4pm, so this kind of help happens during these hours. The volunteer coordinator will send an email when office help is needed. Skills required: Accountability, attention to detail, ability to keep focused on a repetitive task. Do you enjoy detail-oriented tasks? Are you interested in spending time with us in the office? Well then you are probably well suited to become a token counter! We need people who are able to come to our office for a few hours on Mondays or Fridays on a regular basis from May through October. Time commitment: 2-3 hours Monday mornings, 1-2 hours Friday mornings. Skills required: Excellent attention to detail, ability to keep focused on a repetitive task and basic math. Social Media Influencer: Are you constantly documenting your life on Facebook? Do you love sharing with your friends and family on Instagram and Twitter? PFM is hot on Facebook, Instagram and Twitter and needs someone like you to find ‘share-worthy’ fun facts about the market. Which produce is in season? What new products are at the market? Who is that band? Be a PFM social media influencer! Photographer: Do you enjoy the market through the camera lens? Are you always taking portraits of purple cauliflower? Taking videos of people jamming to market tunes? Help build our media library by documenting shoppers, vendors and volunteers in action, special event activities, children playing and the ‘market scene’ in general. Blogger: Are you naturally curious? Do you love to take a deep dive into how things work? We are also interested in bloggers who can write about the interworking of the farmers market and our suitable food system. If you like to wax poetic about the beauty of dancing carrots and giant heads of celery or the incredible edible egg, then this is a job for you! Do you delight in the wonder of children learning something new? Do you consider it a win when a kid falls in love with kale for the first time? Guiding kids in our Kids Cook classes may be the job for you! We believe the first step to getting kids to eat their veggies is to empower them by giving them ownership in the selection and preparation of their own food. Teaching children a life-long understanding of where their food comes from and giving them the skills and tools to cook food for themselves and their family is the beginning of a wonderful relationship with healthy fresh foods. This job will assist our professional cooking instructor in helping kids select produce from market vendors and prepare fruits and veggies in a delicious and simple recipe they can recreate at home. You will also help with set up, clean up, check-in and working directly with kids on skills needed for preparing various recipes. Time commitment: Approx. 2 hours, Sunday mornings at our King market, June 9-July 14, 2019, 9:30 a.m.-11:30 a.m. and Lent’s market, July 7-August 25, 9:30 a.m.-11:30 a.m. Skills required: Interest in interacting with children, patience, some general cooking skills, an ability to think on your feet and move in a fast-paced environment, fun-loving attitude. What motivates you to volunteer for Portland Farmer's Market? What would you consider your ideal volunteer job? Do you prefer to work alone or as part of a group? Are you comfortable working with the public? What strengths will you contribute?